“Irving Berlin’s White Christmas” national tour company. Photo by Jeremy Daniel Photography. Ready or not, it’s here. The Holiday season and its stroll down selective memory lane. “It’s a relief to be just entertained and have fun and not worry about anything,” said Peg Girard, artistic and producing director at Melbourne Civic Theatre. “The big word that pops during the season is ‘nostalgia’,” said Jason Crase, production assistant and outreach coordinator for Cocoa Village Playhouse. And if Baby wants nostalgia, Baby gets nostalgia, especially at the Dr. Phillips Center which will present “Irving Berlin’s White Christmas.” Although thin on the story line, this musical, which is based on the 1954 movie with Bing Crosby, Danny Kaye and Rosemary Clooney, is all singing, all dancing entertainment and all topped off with snow. Familiarity with delightful characters put into heartwarming and sweetly comic situations is the first step into nostalgia’s appeal, Crase said. Then, add some music and beautiful set design evocative of a snowy season and you’ve got surefire hits designed to please all. While MCT will be creating its own production, it still hits on the theme of nostalgia. 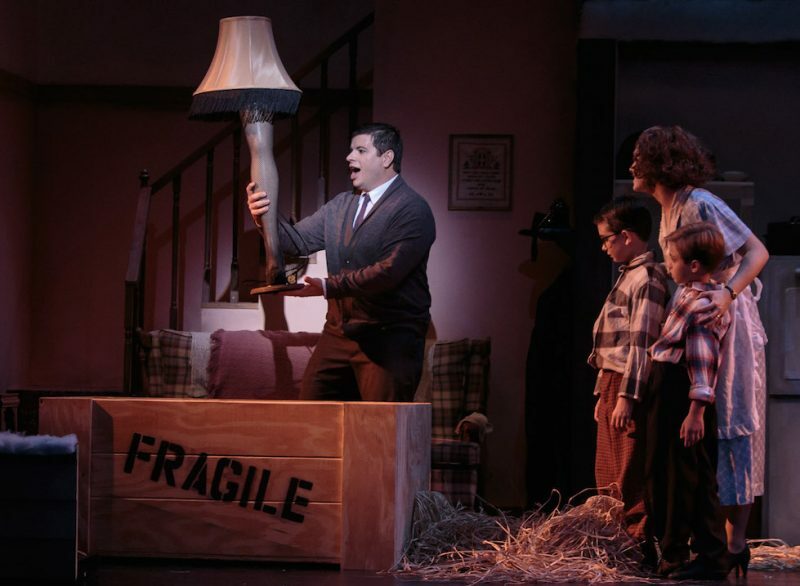 The Playhouse was the first out of community theater’s holiday ate with a real crowd pleaser, “A Christmas Story: The Musical,” running through Dec. 2. Crase said it’s the perfect show for a family feel good experience. Theater producers added music and lyrics by Benj Pasek and Justin Paul and the show opened on Broadway in 2012 for a limited holiday run. Crase said patrons will be enchanted by the charming cast of both adults and children and by the beautiful, homey set design by Joseph Lark Riley. Then there’s also the show’s music, which is a big plus for any holiday show. Next to open is “It’s a Wonderful Life: The New Musical,” which runs Nov. 23 to Dec. 16 at Titusville Playhouse. This, too, is loaded with nostalgia. And, like “A Christmas Story” and “Irving Berlin’s White Christmas,” it is a musical based on a movie. Here, the movie is the 1946 black and white James Capra classic starring Jimmy Stewart as the man who thinks the world would have been better off if he had never been born. Even if you’ve seen a musical recreation of this story before, this version will be new for you, said co-director Niko Stamos. Moreover, he and his co-director, Steven Heron, are putting a high-tech spin on the nostalgia. “We built a false proscenium of a television,” Stamos said. “We installed new projection system. We’re using it multiple ways. We’re incorporating bits and pieces from the original movie. It begins during the overture when images of the movie’s title sequence appear but with TPI’s cast names edited into the sequence. Stamos, who grew up watching the movie every year, said taking family to a walk down memory lane is a good thing. Instead of looking at classic movies, Girard looked toward classic television when she put together “MCT’s Christmas Show starring Alfie Silva,” from Nov. 30 to Dec. 24. Joining Silva will be Kim Cole, Corrine Marie and David Hall. The show is full length and has an intermission. A one-act play written by humorist David Sedaris, this is a palette cleanser for those who have found the holidays a bit too sweet to their liking. Director Stamos is not sure how audiences will take “Santaland Diaries,” but he has two aces up his sleeve: It will be held in TPI’s black box space which has a following expecting something off-beat; and, he has cast TPI favorite leading man, professional actor Patrick Ryan Sullivan in the role of the curmudgeonly elf. He chose well. “Santaland Diaries” tickets were close to selling out before Thanksgiving came and by now, are probably gone. While “Santaland Diaries” sounds like the place to bring children…it is NOT. Decidedly NOT. So instead, take them to the Henegar Center for the family musical “Roald Dahl’s Willy Wonka” from Nov. 30 to Dec. 16. There are a few versions of Dahl’s famous 1964 novel, “Charlie and the Chocolate Factory.” The one the Henegar is using is closest to the 1972 Gene Wilder film, said Henegar artistic director Amanda Cheyenne Manis. Directed by Beth Shestak and choreographed by Natalie McKnight Palmer, the musical tells the familiar story of young Charlie winning a golden ticket and visiting Willie Wonka’s chocolate factory. There are memorable songs like “The Candy Man,” kids, Oompa Loompas and more. While it is not set during the holidays, it certainly has the same appeal. “It’s the fantasy and the good feelings,” Manis said. “A positive resolution. During the holidays, when people are taking families to the theater, these (qualities) are what they want to see. “A Christmas Story: The Musical” runs through Dec. 2 at Cocoa Village Playhouse, 300 Brevard Ave., Cocoa. Tickets are $18 to $ 26. Call 321-636-5050 or visit CocoaVillagePlayhouse.com. “It’s a Wonderful Life: The New Musical” runs to Dec. 16 at Titusville Playhouse, 301 Julia St., Titusville. Tickets are $21 to $29. Call 321-268-1125 or visit TitusvillePlayhouse.com. “Roald Dahl’s Willie Wonka” runs Nov. 30 to Dec. 16 at the Henegar Center, 625 E. New Haven Ave., Melbourne. Tickets are $19 to $29. The Henegar’s parking lot is mostly unavailable due to nearby construction. It is advisable to arrive early to find parking, or to buy valet parking tickets for $10 online up to two hours before curtain. Valet parking tickets available in person for $15. For more information, call 321-723-8698 or visit Henegar.org. “MCT’s Christmas Show starring Alfie Silva” runs Nov. 30 to Dec. 24 at Melbourne Civic Theatre, 817 E. Strawbridge Ave., Melbourne. Tickets are $30. Call 321-723-6935 or visit MyMCT.org or click on their ad. “The Santaland Diaries” runs Dec. 7 to 16 in the TPI Second Stage at Titusville Playhouse, 301 Julia St., Titusville. Tickets are $20. Call 321-268-1125 or visit TitusvillePlayhouse.com. “Irving Berlin’s White Christmas the Musical” runs Dec. 18 to 23 at Dr. Phillips Center, 445 S. Magnolia Avenue, Orlando. Ticket prices and show times vary. Call 844-513-2014 or visit DrPhillipsCenter.org. This is a edited version of a story running in the Melbourne Beachsider.